You can specify the quantity in the shopping cart. Please come back after November 1st to order online. If you'd like an email reminder when the calendar is available for sale, sign up on the Mail List. 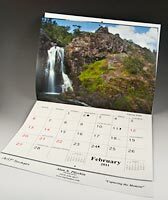 Since 1995, Marin County business professionals have found personalized Marin Visions calendars an effective and affordable marketing tool.